Have you ever walked away from some sort of tragedy and wondered how in the world you could have possibly survived? My family and I did just that on Saturday the 15th. 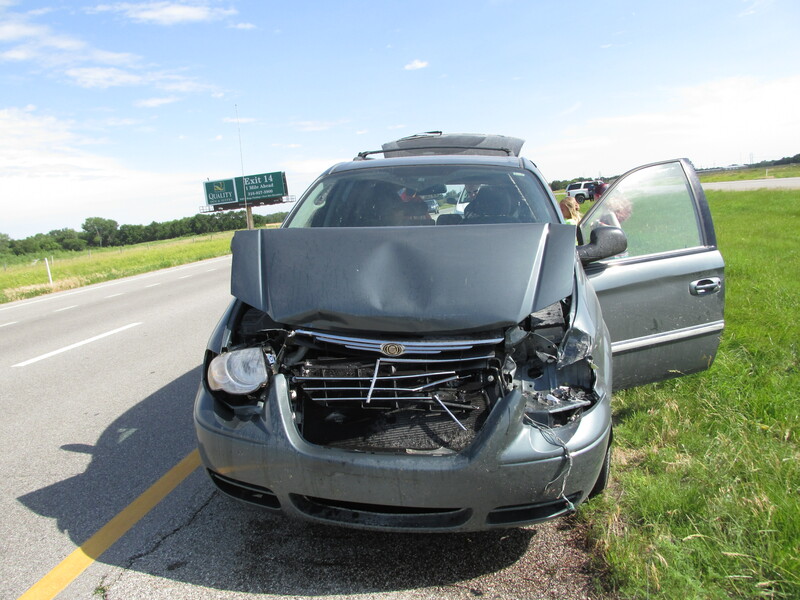 We were in a car accident on interstate traveling at high speeds between 60-70 mph. Saturday afternoon we were headed home from Wichita after picking up my son, D, and his friend from church camp down near the Oklahoma border. My teen daughter and my toddler son were with us as well, which meant we had a total of six of us all together. We had spent the morning shopping and were looking forward to being home and relaxing the rest of the weekend while celebrating Father’s Day with my husband’s family. We hadn’t gotten far down the interstate just outside of Park City when a black SUV pulled from the right shoulder of the road and crossed clear over to the passing lane on the left, right in front of us. We were in the passing lane passing a semi. My husband, Billy, slowed down a bit, not knowing what was going on. The SUV was acting like it didn’t know what it was doing. I noticed that there was another vehicle, also a SUV but white, in front of the one we were following. Pretty soon, the SUV in front of us, slowed to about 65 mph. The semi we just passed went around us on the right side along with other vehicles behind it, which meant we were blocked in. We drove that way for a couple of minutes waiting for the long line of vehicles on the right of us. Then, without warning, the black SUV slammed on its brakes! Billy hit the brakes and it looked like we could stop in time, but then as if in slow motion, Billy yelled, “Hang on! We’re going to hit them!” I braced myself by putting my hands on the dash in front of me. 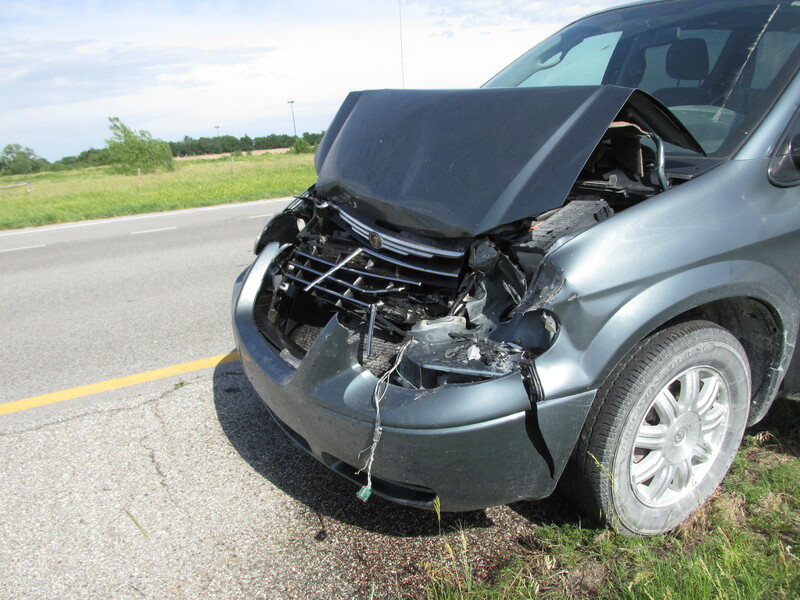 We hit head on into the back of the SUV…the whole front end of the mini van we were in crumpled up towards us. I hear screaming and crying from my baby boy. Fear permeates my body and soul. I undo my seatbelt and head back to the kids. My oldest son, D, and daughter were wide-eyed as I asked them if they were okay and if they had noticed if their little brother had been jarred really bad. They didn’t know. (I don’t know why I asked. They were just in the same tragedy I was). I look over and my son’s friend was doubled over holding his stomach. Then my daughter starts crying. D reaches over and holds her just as I burst into tears. Billy had gotten out and was yelling at the owners of the SUV. He was worried that his family was hurt. Pretty soon, several other people show up and as it turns out, the two SUV’s were traveling together full of people. The white SUV had turned off into one of the emergency vehicle turn offs and the other was trying to follow, but not knowing what the other was doing, had slammed on its brakes to try to make the turn. I called our Pastor immediately to tell him what was going on. We had borrowed their vehicle to accommodate the number of us traveling together and we were still in harm’s way. We needed prayer and I was panicking because we had just totalled a vehicle that wasn’t our own! It started getting very warm in our vehicle due to the Kansas sun, so I open the side door to let in some fresh air. The noise from the oncoming traffic was horrific and the smell of the chemicals leaking from the vehicle was nauseating , so I tried to shut the door again, but it wouldn’t close. The impact bent the frame of the vehicle not allowing the door to reclose. My husband reaches in, looks everyone over and gets our little guy out of his rear facing car seat. To think that we were just looking not a couple of hours before for a front facing car seat to replace this one. Would our baby have been as protected? Probably not…God knew. Thank God we didn’t find one we wanted. I call Billy’s parents to let them know what is going on and ask for more prayer. The traffic is horrible! What is going on? As I’m on the phone, a Highway Patrolman pulls up. Someone must have called 9-1-1. The officer starts asking questions and Billy heads toward us telling us that the other driver we hit only had a Mexico driver’s license and didn’t speak English. After several minutes, I get out of the van and head to the ditch. I realize my wrist and hand are really hurting. My kids eventually follow me and we all wait in the ditch. I feel a little better having everyone out of the van. We each give our information to the officer just as Billy’s sister and husband show up. Billy had called them to come pick us up due to the van being totalled. Long story short, there were races going on, which accounts for the overflow of traffic on interstate. My son’s friend and I ended up in the emergency room, both had CT scans-mine for my neck and his for his abdominal pain. I also had X-rays on my wrist. Everything came out clear. I only had a sprained wrist. The SUV owners were cited for the accident and lack of insurance. The father of the boy we had with us drove three hours to pick us all up and drive us back home. We got home about 12:30am. 1. If we had found a new car seat for our son, he would have been forward facing and probably would have been seriously hurt. Despite the fact he is old enough to be forward facing, he is better off in a rear facing car seat, which we now HAVE to get a new one due to the car accident. We never felt good about any of the car seats we looked at. I give glory to God for making us feel at unrest about them. 2. In most instances like ours, some people end up dead or critically hurt. Traveling at 60-70 mph and rear ended a vehicle is serious! How is it possible that we were okay? Well, only by the grace of my God, did we walk away unscathed. 3. A lot of times, my older son, D, insists that he doesn’t need his seat belt, so he will sneakily not put it on or will pretend he does for our benefit then will ride unbuckled. On this day, he actually had his on. 4. Before we asked to borrow our Pastor’s vehicle, we thought about either my husband or I riding our motorcycle to accommodate for the lack of enough space in our vehicle. If we had decided on doing this, and had the same accident, the one riding the motorcycle would have been instantly dead. There were so many other things that I could tell about God’s power and total control in this situation, but right now I still sit in shock. Why though do we always act surprised when God shows his faithfulness?